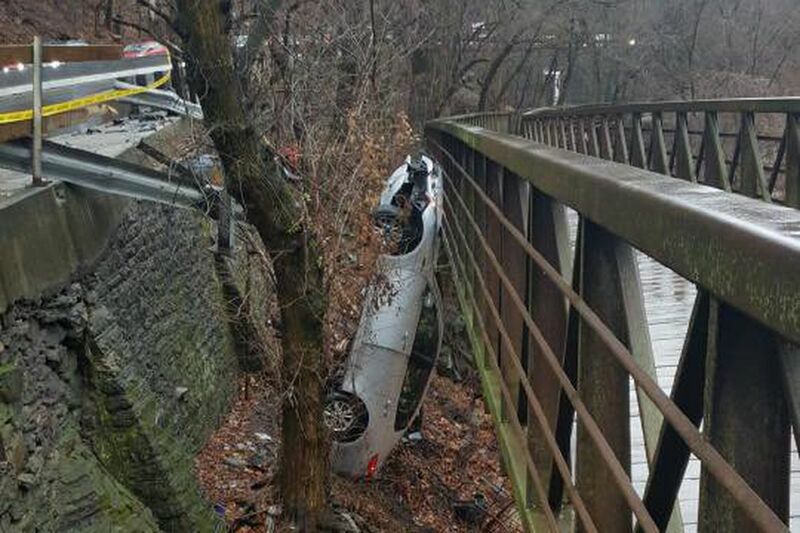 A car stands upright on the wrong side of a Lincoln Drive guard rail, leaning against an elevated section of the Wissahickon Bike Trail. Philadelphia Streets Department has touted the $12 million Lincoln Drive project as part of its increased “Vision Zero” initiative. In 2018, news networks raced to report a growing threat to our safety and well-being. Industry players slammed their brakes to mobilize coordinated private sector efforts, sending markets to a screeching halt. Federal investigations shifted into high gear. The crisis? Five people dead and 200 hospitalized from tainted lettuce. Given such a strong response to rotten romaine, surely our elected politicians and public servants have spared no expense to address other public health crises, right? Nationwide, car crashes claimed more than 40,000 lives in 2017 and injured 4.5 million. Last year in Philadelphia, more than 100 people were killed in traffic violence — 21 on Roosevelt Boulevard alone. Between 2017 and 2018, Philadelphia police collected nearly 29,000 hit-and-run reports — more than 40 hit-and-runs every day. PennDot’s attempts to address traffic safety in Pennsylvania have, so far, come up short. Governor Wolf made a show of designating $11.5 million for street safety improvements across Pennsylvania through the Automated Red Light Enforcement (ARLE) fund. But compared to PennDot’s $9 billion in expenditures, ARLE funds are a drop in the oil pan. PennDot will spend three times more on pothole repair — more than $35 million — than they’re willing to invest in reducing traffic deaths. Consider Philadelphia, where PennDot is responsible for about 500 miles of our 2,500-mile street network. The city’s most dangerous streets comprise a 283-mile High Injury Network, accounting for more than half of all traffic deaths and severe injuries. Despite making up just about 20 percent of Philadelphia’s total street miles, PennDot streets account for the majority — 58 percent — of high-injury streets, according to an analysis by mapping expert Daniel McGlone. Put another way, Philadelphians are six times more likely to be killed or severely injured on a PennDot street. Of all PennDot’s streets in Philadelphia, 33 percent are part of the High Injury Network, McGlone found. Further, PennDot streets are the most likely to be dangerous for long stretches. Roosevelt Blvd., Frankford Ave., Broad Street, and Chestnut Street have the most lane miles on the High Injury Network. This week’s trolley crash that left 30 people injured will likely qualify Chester Ave., another PennDot street, for the High Injury Network. The collision may have been avoided if PennDot prioritized transportation of people, rather than throughput of automobiles. Locally, Philadelphia’s Office of Transportation, Infrastructure, and Sustainability (OTIS) is working to address street safety issues through its Vision Zero program. In January, OTIS accepted applications for its Neighborhood Slow Zone program, designed to protect pedestrians and discourage poor driver behavior in dangerous areas. Even though more than 20 neighborhoods demonstrated strong support for safety improvements, state money will fund engagements with only two. And since Neighborhood Slow Zones are a City program, PennDot streets will be excluded. Despite repeatedly stating their commitment to Vision Zero, Philly’s Streets Department has not integrated pedestrian-first approaches into its standard practices. PennDot has not yet embraced Vision Zero’s goal of eliminating traffic deaths and serious injuries. Both offices continue to spend billions on essentially maintaining the same deadly infrastructure. Reexamining our deadly car-centric engineering practices can have diverse benefits. Our transportation dollars could be allocated to create jobs, make greener trips easier, and save lives. Every trip taken on foot, bike, or public transit means fewer automobiles on the road. Investment in alternative travel modes would even alleviate our congestion woes. Achieving Vision Zero also means achieving more equitable streets, given that Philadelphia’s traffic injuries and deaths disproportionately affect poorer communities, and communities of color. There are steps PennDot is taking right now, like bringing speed cameras to Roosevelt Boulevard, upgrading traffic signals, coordinating plans with local agencies, and investing in multimodal infrastructure. But for Philadelphia to make sustained progress towards eliminating traffic violence, we need Governor Wolf, PennDot Secretary Leslie Richards, and state legislators to do their part and lead in fundamentally redefining our priorities. Aaron Bauman is a volunteer with 5th Square political action committee and Neighborhood Slow Zone organizer. He lives in South Philadelphia with his wife and daughter.